Become Career » How Do I Become an Art Therapist? Art therapy is a practice that involves the use of a variety of types of art, such as visual arts, music, dance, and drama to help individuals explore feelings, develop social skills, reduce anxiety, and even alleviate symptoms from medical conditions. Art therapists are effective members of the healthcare field and they combine a variety of techniques with the healing potential of art in many different settings. Art therapists work with people of all ages, from infants to the elderly. Individuals wanting to work as art therapists typically need a master’s degree in art therapy or related area from an accredited college or university. Majority of graduate degree programs also require completion of a bachelor’s degree from an accredited institution. Additionally, some master’s degree programs require individuals to complete a specific amount of hours of studio art experiences. The master’s degree usually requires at least 48 semester credits, including a minimum of 24 semester credits in art therapy. 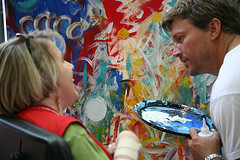 The program must include coursework in the history and theory of art therapy, art therapy techniques, art therapy applications in different settings, art therapy assessment, art therapy in group settings, standards of practice in art therapy, ethical and legal issues in art therapy, and cultural and social diversity. Most programs include a thesis or culminating project. For the practicum and internship experiences, students must complete at least 100 hours of supervised art therapy in observation and practice and 600 hours of direct contact with patients. At least 350 of the direct contact hours must be spent caring for clients individually or in group environments. Those who wish to become a registered art therapist must receive a passing score on the examination administered by the Art Therapy Credentials Board. The minimum requirements to sit for the exam is a master’s degree in art therapy that includes a core curriculum, supervised practicum, and internship experiences. Applicants must also have at least 1,000 hours of documented supervised clinical experience after graduation. The board also offers a board certification and certification in art therapy supervision. Future art therapists must have a sound understanding of various types of art and creative media. They should have a natural comfort with the field to be able to successfully help patients. They need the ability to assess their clients in an objective manner to create an effective treatment plan. Empathy, compassion, patience, and the ability to listen carefully are necessary qualities. Good communication and interpersonal skills are also essential, as art therapists commonly need to collaborate with other professionals about the care of clients. Since caring professions commonly inflict stress, the ability to work long hours and handle stressful situations is also valuable for art therapists. Becoming an art therapist is an ideal choice for those who seek to use artistic techniques to help improve the lives of many different individuals. Completing the necessary education, licensing, and acquiring desirable skills is a great starting point for those that want to break into this career.